It seems that there is still 1 graphics card also based on Hawaii silicon, that sits somewhere in between the R9 280X and the R9 290X, it’s the AMD Radeon R9 290. 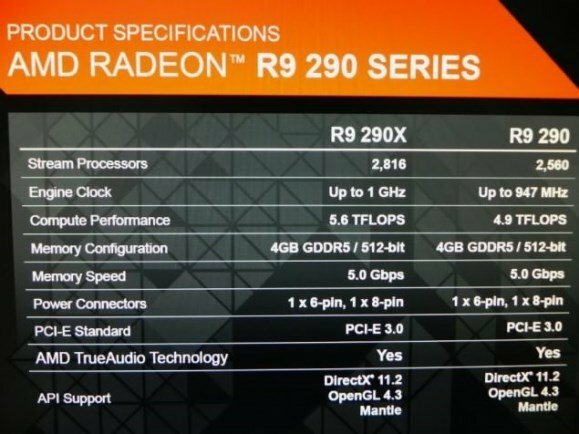 Just recently, a slide was leaked from a Japanese site confirming the specifications of the R9 290X plus its little brother the non-X version, Radeon R9 290. Check them out below. The AMD Radeon R9 290X is based on the Hawaii XT chip that is geared towards heavy to extreme gamers, and will compete with NVIDIA’s flagship graphics cards like the GTX Titan and GTX 780. It features 2,816 stream processor with Engine Clock speeds from 800MHz of up to 1GHz. It also has 176 Texture Mapping Units and 44 Raster Operators. Another advantage of the R9 290X is the huge 4GB GDDR5 memory in a 512-bit memory interface. Last generation was only 384-bit bus. The effective memory speed is around 5Gbps, and thanks to the new technology incorporated it can do up to 4-Way CrossFireX without the need of a CrossFire bridge or connector, like most multiple-GPU setup does. Meanwhile, the AMD Radeon R9 290 is not a bad deal as well. It’s the little brother of the R9 290X and makes use of a Hawaii Pro chip. It has a slightly lower Stream Processors of 2,560, and a slightly slower clock speeds. Nevertheless, some or most of the R9 290 and 290X’s specifications and features are similar. Like its big brother it doesn’t use any CrossFire bridge/connector either and can support Ultra HD or 4K display resolutions. Both the Radeon R9 290 and R9 290X supports DirectX 11.2 and Mantle API and will be bundled with the upcoming game Battlefield 4, which by the way would take advantage of the new features that the new R9 290 lineup have. Reports has it that the AMD Radeon R9 290X has an SRP of around $699, but it was already listed on Newegg for $729.99, and perhaps slightly higher for the Asus R9 290X DirectCU II Top edition. Meanwhile the Radeon R9 290, is rumored to be priced somewhere around $449-499 USD. With the currently pricing that AMD has placed upon their new Hawaii lineup, I’m sure NVIDIA will counter this, otherwise, most PC Enthusiast or Gamers, specially the new consumers would opt for the new Hawaii lineup, offering a more attractive/affordable price per performance.